Survivor: Worlds Apart (2015) - 7th place, 12th out - 5th juror. Idoled out in Episode 12, "Holding On For Dear Life" (Day 32). Worlds Apart Ep. 1 RC/IC: "Ladder Daze" - No major solo contributions; Masaya loses on the puzzle (3rd/3). Worlds Apart Ep. 2 RC/IC: "Basket Case" - First swimmer, then rebounds (mostly unneeded), and Masaya wins (1st/3). Worlds Apart Ep. 3 RC/IC: "Dear Liza" - Helps carry and pour the bucket, and Masaya doesn't lose (2nd*/3). Worlds Apart Ep. 4 RC: "Collar Blind" - Sits out, as White Collar avoids being Brained (2nd/3). Worlds Apart Ep. 4 IC: "Houses of the Holey" - Swaps out on the final ball, and White Collar avoids losing once again (2nd*/3). Worlds Apart Ep. 5 RC: "Beach Balls" - Now with New Escameca, makes a catch, and Escameca wins big (5-2). Worlds Apart Ep. 5 IC: "Swing Break" - Paired with Joaquin pulling the sled; Escameca wins big again. Worlds Apart Ep. 6 RC: "Air Raid" - Never hits the target for Escameca, and they lose, barely (6-5). Worlds Apart Ep. 6 IC: "Shut Your Trap" - Not shown playing, as Mike and Rodney throw the challenge. Worlds Apart Ep. 9 RC: "O-Black Water"- Part of the winning team, with Mike, Shirin, Dan, and Sierra. Worlds Apart Ep. 11 RC: "Barrel Bridge" - Leads the winning team, with Carolyn, Dan, and Will. Worlds Apart Ep. 12 RC: "Dulcimer Stomp" - Part of the losing team, with Dan and Rodney. *Note: Second-place finishes in the 3-tribe phase of Worlds Apart count as half a win. Worlds Apart, Ep.7 IC: "Get A Grip" - Third to drop out, fairly early (10th/12). 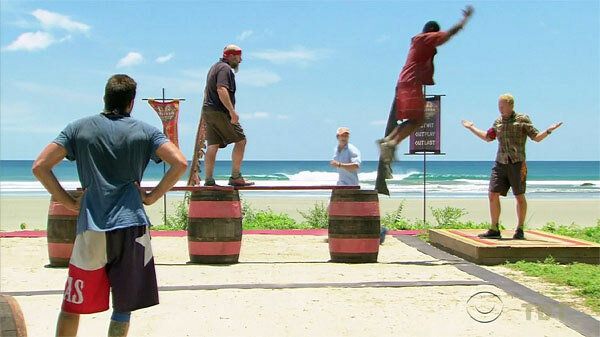 Worlds Apart Ep.8 RC: "Anchorman" - Only collected two bags, does not win (tie-5th/11). Worlds Apart Ep.8 IC: "Hip to be Square" - Third to reach the final puzzle, does not win (3rd/11). Worlds Apart Ep. 9 IC: "Keep on your Toes" - Lasts over 30 minutes, and Tyler wins (1st/10). Worlds Apart Ep. 10 IC: "Soul to Squeeze" - Places four out of six balls (2nd/9). Worlds Apart Ep. 11 IC: "Water Weight" - At 15 minutes, outlasts Sierra, but that's it. First man out (5th/5). Worlds Apart Ep. 12 IC: "Back Splash" - Outlasts all but Carolyn (2nd/7). Worlds Apart, Ep. 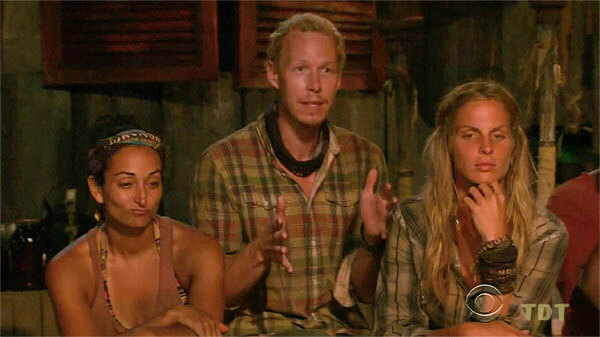 1: So Kim (voted out, 4-2). Worlds Apart, Ep. 8: Hali Ford (voted out, 7-4). Worlds Apart, Ep. 10: Jenn Brown (voted out, 5-3-1). Worlds Apart, Ep. 11: Two votes, from Mike and Shirin. Worlds Apart, Ep. 12: Three votes, from Mike, Sierra, and Carolyn (idoled out, -3). Worlds Apart, Ep. 14: Voted for Mike Holloway (who won, 6-1-1). When did we become the naked tribe? Yay, black merge buffs. That's original. Now the game really starts, etc. Soon it will be too late! Will has to leave? Harsh. Just remember, Dan. Mike is evil. No! Don't vote for me! Getting back to camp, Mike looks happy. Early Ep12. I had to write someone else's name down in case Mike played his idol. Duh. You could think about playing it for me, maybe, Carolyn. Right? Gordon Holmes at XfinityTV : "Tyler - 'I'm Not Going to Wear My Wedding Ring'"
Kimberly Nordyke at The Hollywood Reporter: "Survivor Castaway Says Competing on the Show Is Harder Than Working at CAA, Playing in NFL"
Gordon Holmes at XfinityTV.com: "Tyler : 'Had I Known I Would Have Blown It Up'"
Rob Cesternino at RHAP: "Exit Interview With the Latest Player Voted Off Worlds Apart - 5/07/15"
Josh Wigler at Parade.com: "Tyler Fredrickson: 'I Didn't Know What Hit Me'"
Daniel Fienberg at HitFix.com: "Tyler Fredrickson Talks Survivor: Worlds Apart"
"Inspiration in Life: Steven Spielberg because he succeeded by convincing everyone at Universal Studios (including lying to the gate guard!) that he was a director before he ever was. Hobbies: Doing what others won’t, traveling and dressing up as a bearded hobo and jumping out at children in downtown Pasadena. Pet Peeves: Quitters, apathy, people with horrible work ethics and whiners. If You Could Have 3 Things on The Island What Would They Be and Why? 1. Scuba gear because I can’t get enough of the ocean. 2. Bottle of cabernet because it’s a great sunset drink with a girl. 3. I’m big on nostalgia so a camera. Why You’ll “Survive” Survivor: Coming from the top agency, I survived-alone - the dragons and snakes, daily. I was dealing with the largest and most insecure egos in town. Everyone was the best, the brightest, and the most beautiful…even when they were not. You could abhor them but it was done with a smile so they had no idea. THAT’S Survivor. Why Will You Be the Sole Survivor: I worked two years at the top agency in the world- I can outwit. I have two master degrees, one from Berkeley and one from USC- I can outsmart. I played on seven professional football teams- I can outlast."